I have never felt spring emerge the way I have in Aix-en-Provence. In April’s infancy, the plane trees were ghostly bare and the shoppers at the outdoor markets were still bowing to the wind, heads down and tucked into their beautiful French scarves. In a few short weeks the shiver has been replaced by billowing trees and saffron-colored bouquets of the season’s first blooms. Shoppers linger in the markets to listen to musicians while feasting on quiche Lorraine and sipping fruity vin rosé. Bulbs are pushing through with ferocious tenacity and the wine makers are praying that no frost will follow the warmth of these early spring days. Everyone is outside any chance that arises for every possible moment. Cafes set up tables in every corner square, people watchers perch on bar stools along the Cours Mirabeau (Aix-en-Provence’s most lively thoroughfare), and families teeter on the edge of fountains. 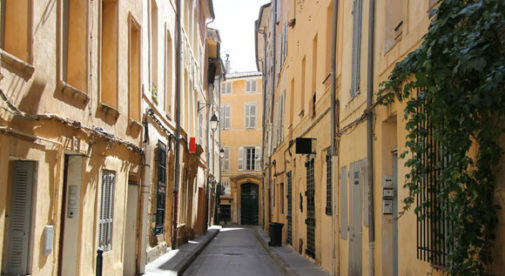 With a population of just 140,000, you might expect Aix to be a traditional Provençal town…but this city has a buzz that far exceeds the relatively small population. Some say it is the hip student crowd, the central location, or the pedestrianized historic center. It is all of those things and more. It is the essence of French style, coupled with the colorful chronicled past, captured by artists such as Van Gogh, Matisse and Picasso for generations. The locals move through the city with purpose but without appearing hurried. There is a deep appreciation of beautiful things, something that is presented effortlessly through architecture, fashion and a confidence I have only ever witnessed in France. The magic of Aix-en-Provence is that in 30 minutes my family and I can be in Cassis dipping our toes in the French Riviera. Other families do the same. While children ride on the Jules Verne vintage carousel, their parents savor wine perfumed by the sea. There is a sense that the sun doesn’t set until the French have completed their day by par la mer (by the sea). If we fancy a country picnic versus the seaside, we weave through vineyards in the lowlands to the picturesque villages of La Luberon in just 30 minutes. Or, in less than 30 minutes in another direction, we can be hiking around Sainte-Victoire, a mountain so striking that famed artist Cezanne was said to have painted this marvel over 60 times. If we feel like venturing a bit further, perhaps an hour or two, Avignon, Nice, and Arles await our exploration. We’re only staying for a short time in Aix…but if you’d like to stay a little longer here, you’ll find plenty of property to choose from for sale. One two-bedroom, 700-square-foot apartment which dates back to 1780, is on the market at the moment for $170,000. Or, if you have a bigger budget and want a show-stopping home, right now you can buy a five-bedroom, 1,292-square-foot house—on 4,747 square foot of land, including a pool and fruit trees—for $525,000.